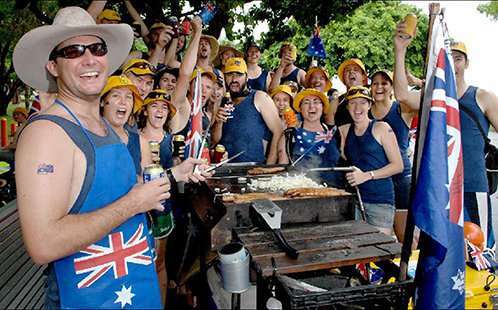 Australia Day; it's snags on the barbie, mozzies, long necks, Akubra hats and that all Aussie sun blazing through our SPF 50+. But what is it that makes good ol' Straya so unique? Well, it's the accent of course. The Australian accent has evolved at a phenomenal rate since European settlers first met the original inhabitants of the continent, and later mixed with new immigrants to create today's Australia. Stacey Sherwood, a Ph.D. student at the MARCS Institute for Brain, Behaviour and Development, (who is researching social knowledge in the production and perception of linguistic variation), said speakers of the present- day Australian accent were not all born here, with many people having arrived here as children. "In fact the Australian accent developed from generations of migrants from diverse origins," she said. "All accents have features which make them unique, and ours is no different. "The Australian accent is distinctive and uniquely ours. The things we talk about and the ways we talk about them are intimately entwined within our sense of self." Ms Sherwood said Australian English, or Strine, has particular ways of pronouncing vowels and consonants to distinguish it from other varieties of English. She said the major influences of Strine were Cockney and Irish English, but also English spoken by Aboriginal and Torres Strait Islander peoples who contributed many iconic words to our modern vocabulary such as; kangaroo, wombat, billabong etc. To help understand the history and evolution of Strine, a large-scale collaborative research project was launched in 2011. Western Sydney University was the leading institution responsible for creating the largest state-of-the-art database of modern Australian English—AusTalk. Dr. Dominique Estival, a senior researcher at the MARCS Institute at Western Sydney University, was one of the leading researchers on the AusTalk project that took more than five years to complete. She said Australian English had changed so significantly throughout its history that it had become "a matter of national interest to carefully document our linguistic heritage as an important record of our collective identity within our changing culture." "Our accent is a powerful and enduring symbol of national identity that we preserve despite the influx of electronic media and cultural icons. However, just as society changes, so too does language as it constantly evolves to meet the changing needs of its users." Dr. Estival said AusTalk provided a valuable digital repository of present day speech as a snapshot of Australian linguistic history. She said AusTalk was a national treasure that will provide a permanent record of Australian English. "It will also support Australian speech science research and development, and help develop Australian speech technology applications, from better telephone-based speech recognition systems (e.g., taxi bookings) and computer avatars, to hearing aids and improvements in Cochlear Implants, or computer aids for learning-impaired children."